Fourth Amendment and autonomous vehicles: Should cops need a warrant for driverless car data? Should cops need a warrant to access data from your self-driving vehicle? 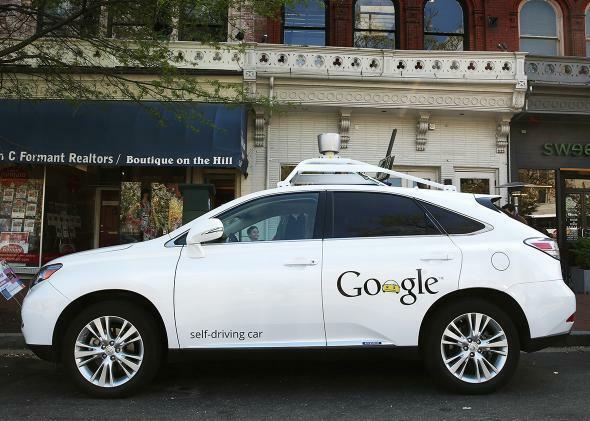 Google’s self-driving car, parked on Pennsylvania Avenue on April 23, 2014, in Washington. Driverless cars are still in their infancy—Google’s cute little vehicles don’t go faster than 25 mph. Nevertheless, courts around the country are currently deciding the future privacy rights of self-driving car owners. The opinions that judges write today will determine whether the police searching your car 20 years from now will be able to see everywhere the car has ever driven you, how long you stayed there, possibly who was with you, your communications from the car, etc. Think about all the places you travel in your car or the conversations you have in your car. How easily do you want that information available to a search? One court making decisions that will affect autonomous cars is the Massachusetts Supreme Judicial Court, which is currently considering its decision in Commonwealth v. Dorelas, a case examining how specific a warrant must be before police can search a smartphone. (Full disclosure: I helped the American Civil Liberties Union of Massachusetts draft its amicus brief.) There are two major schools of thought about warrants for searching cellphones. The first considers a smartphone a “container” and holds that a warrant essentially needs only to describe the phone and the probable cause. The second recognizes that smartphones are computers with tens of thousands of files; to satisfy the Fourth Amendment, which prohibits unreasonable search and seizure, a warrant must describe the phone and files sought, as well as explain the probable cause. So what do cellphone cases have to do with autonomous vehicles 20 years from now? Future courts will look to case law surrounding the Fourth Amendment and smartphones when considering the constitutionality of self-driving car searches, and their decisions will depend on how similar they believe the data stored by the two technologies to be. And that data could say an awful lot. An arrest related to possession of a controlled substance leads naturally to data regarding where the suspect went to buy the substance, where he meets other people who possess the substance, etc. All that evidence is relevant to the arrest, implicating the arrestee and a number of other people. If warrants are necessary, the courts will encounter the same questions they’ve run into with smartphones. What kind of warrant will be necessary? That depends, again, on the container versus computer question. Besides reminding us that there are people in an alternate universe out there referring to their cellphones as Rolodexes without any irony, Roberts’ opinion foreshadows how courts will consider the privacy of your autonomous car. How closely courts follow the case law governing cellphones under the Fourth Amendment will likely depend on how they view the breadth of the data contained in self-driving vehicles and the variety of functions they perform. The more data the cars collect from different uses, the greater the Fourth Amendment protection courts are likely to find. If self-driving cars merely drive you from place to place—limiting data to your movement—courts may be less likely to find that data protected by the Fourth Amendment. In that case, police could search it with only a broad warrant (or, if car case law hasn’t changed, even without a warrant, if it’s relevant to arrest). Justice Sonia Sotomayor has wondered about “the existence of a reasonable societal expectation of privacy in the sum of one’s public movements.” But currently, most things you do in public are, for constitutional purposes, public, and you have no expectation of privacy in them. However, if you can email, text, conduct Web searches, take photos and videos, and more through the car, courts will be more likely to view autonomous vehicles as similar to smartphones, with multiple functions and with hard drives full of personal information. As with cellphones, police would likely be prevented from searching your autonomous car’s memory without a warrant, likely one that specifically states the data and directory within the car’s computer where that data is located. And as our future example demonstrates, the difference between three days’ worth of specific data and all the data your car accumulates over a lifetime of use is huge, particularly if manufacturers incorporate numerous web and communication uses. This brings us back to Dorelas, the Massachusetts case currently being decided. In 2011, the police searched nearly all of the data on the defendant’s phone—calls, texts, photos, emails, Internet activity, etc.—even though the evidence cited in the warrant indicated that only the voice mail and text messages would have relevant information. Twenty years from now a similarly broad search of an autonomous car may result in law enforcement searching a driver’s travel history over the previous five years, even though the evidence only suggests that the driver’s movements during the last week are relevant. I agree with Sotomayor—one of my public actions is a public action, but I have an interest in keeping private the aggregate of all my public actions. Anything less legitimizes a surveillance state, autonomous or otherwise.